- 1/2", 3/4, 1", 1.1/4", 1.1/2", 2"
- Apart from standard, We develop customize parts as per technical drawing or other relevent data. Manufacturer, supplier and exporter of Brass Moulding Inserts/PPR /CPVC Fitting. With the support of our experts and sophisticated in-house facilities, we are engaged in offering a wide range of PPR Brass Fittings. Under the supervision of our stern professionals, offered fittings are manufactured using superior quality brass and other allied material. - Threads as per international GO & NO-GO Standards. - Deep groove for maximum pull out resistance. - Inner diameter (I/D) after threads with very close tolerance to prevent unnecessary flush to inter into the inserts. 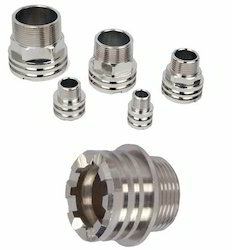 Axelon International manufactures a very wide range of male PPR Brass Fittings in different Threads, Types and Sizes. These Fittings are suitable for most of the applicable PPR pipes. These are manufactured under strict quality control and can be manufactured as per customer specifications. Thread Size: 0.5", 0.75" , 1" M/F. - Threaded pipe fittings are threated pipe fittings for use with threat paste or teflon tape sealant. With sincerity and hard work of our experts, we have carved a niche for ourselves in this domain by manufacturing a high quality range of Brass PPR Male Inserts. We are a Manufacturer, Developer, Exporter of Brass Inserts for PPR Fittings based at Jamnagar, Gujarat, India. We are offering Brass CPVC Inserts those are made by supreme quality of material. - Threads as per International Go & Not Go Standards.